Stencil-Painted Rose Cake! 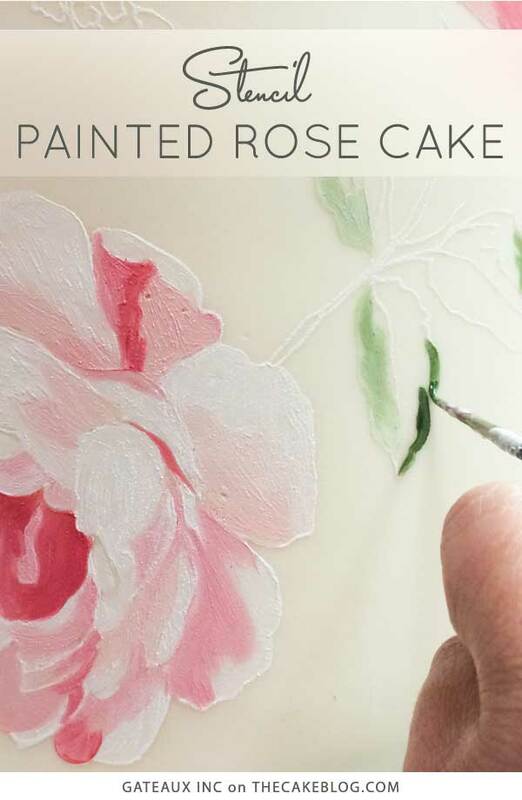 Learn how to make this gorgeous hand-painted rose cake, using cake stencils and an innovative cake decorating technique. We’re so excited to welcome Robin Martin of Gateaux Inc. back to the blog today! 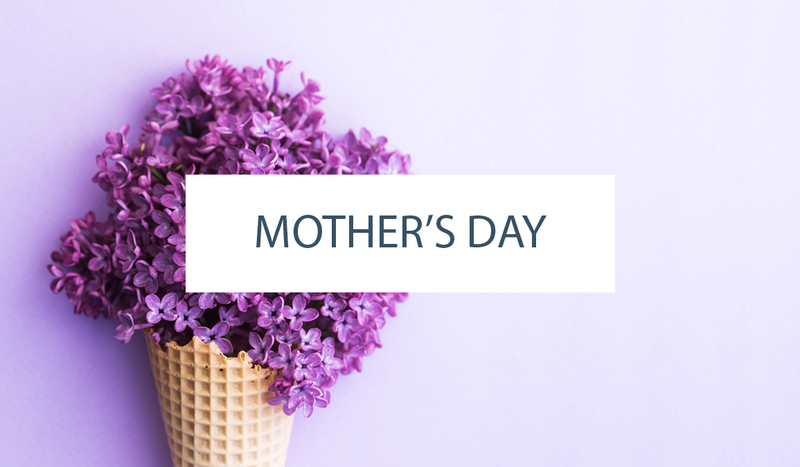 We know that when Robin stops by, she’s bringing us something new and innovative! And today is no exception. Not only does Robin create gorgeous cakes as the owner of Gateaux Inc., but she is the mastermind behind an entire line of cake stencils which are nothing less than brilliant and appropriately branded as the the Evil Cake Genius line. Over the last year, we’ve learned how to make gorgeous lace using a stencil and how to make amazing fondant butterflies with realistic (and yes, stenciled) details, thanks to Robin’s techniques. And today’s cake is a whole new world of fun! A skillfully hand-painted cake that is downright gorgeous and actually do-able. 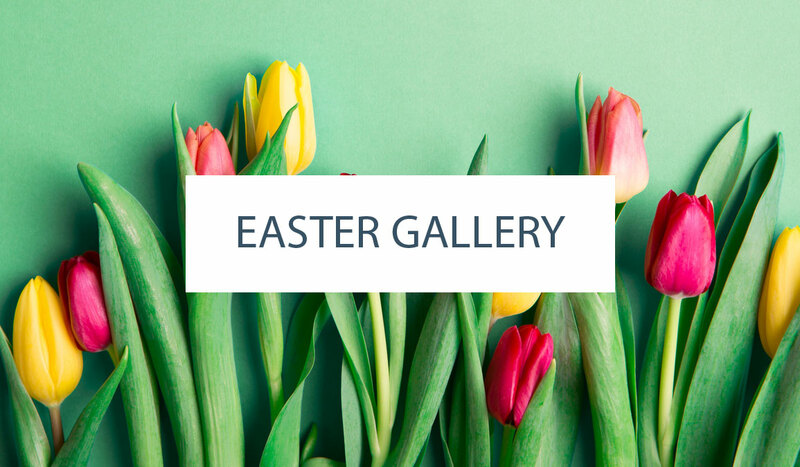 Even for those of us who are not natural painters (if you could see me, I’m raising my hand…. how about you?). If you love the idea of a painted cake but are intimated by the actual ‘hand-painting’ aspect, then today’s post is definitely for you! So let’s do a little swooning and then take an inside look at the creation of this amazing cake. We’re learning how to make a Stencil-Painted Rose Cake! 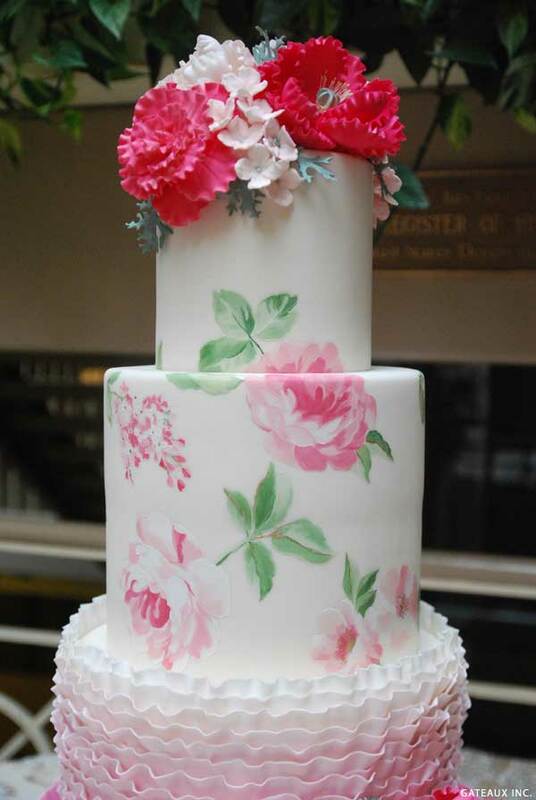 “The stencil was then used to transfer the floral pattern to the side of the cake tier using a mixture of Petal Dust powdered color and, of all things, cooking oil! We experimented with all sorts of edible painting media before deciding that this was the edible “paint” that allowed us to blend the outline of the stenciled pattern perfectly back into the hand-painting. It also allows for beautiful blending of colors because the oil keeps the paint from drying out for quite awhile. The combination of a perfectly stenciled outline and the slow-drying edible paint, made decorating this cake truly one of the most enjoyable decorating experiences the Evil Cake Genius has ever had. I had flashbacks to the old “Paint by Numbers” kits that I used to do when I was a kid. Wow!! Amazingly beautiful cake. Loved these pallets. Beautiful cake so glad you mentioned stencils and why. So many people who do not cake think we all just freehand that stuff, then sneer when you say ” why no I traced it and worked from there”. Hi, I love the stencilled cake and would really like to get the kit you mentioned, the problem, I live in the UK and have no idea where I mightbe able to purchase it. HELP!!!! There are links to the vendor in the post above – they ship internationally! Hooray!! If you don’t mind me asking, What brand paint did you use? Which colur are used for painting?? Maybe I missed something in above details.please advice. Robin made the edible paint using petal dust and cooking oil. She did not provide specific shades for this post, but more detailed instructions come with the stencil kit, if you choose to order it. Hi, what edible paint did you use? Robin made the edible paint using petal dust and cooking oil. hi, how can use de stencil over the cake, how can i do for transfer de stencil to the cake?, what is the white line? 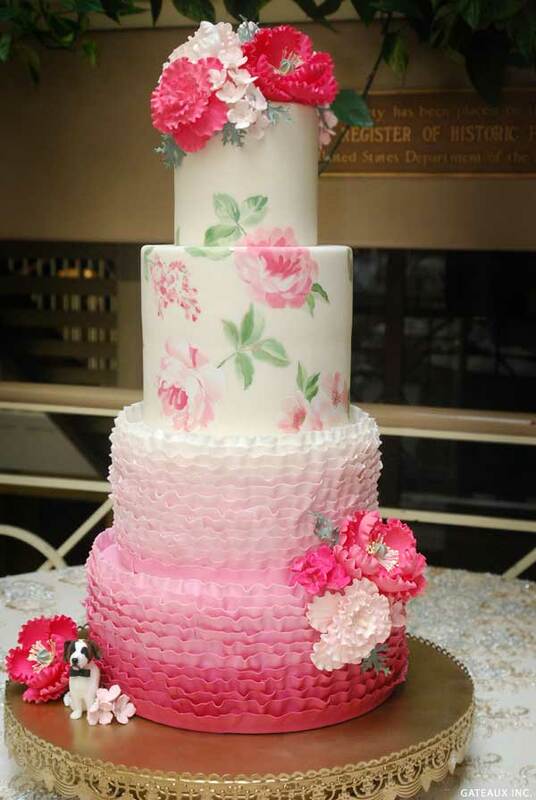 The stencil was used to transfer the floral pattern to the cake using a mixture of petal dust and cooking oil. The specific shades and more detailed instructions come with the stencil kit. Hope that helps!